The Expert Advisor allows you to build a trading system based on a custom indicator. It performs automated opening / closing of trades based on signals from an indicator that places values ​​other than 0 and EMPTY_VALUE in the buffer. 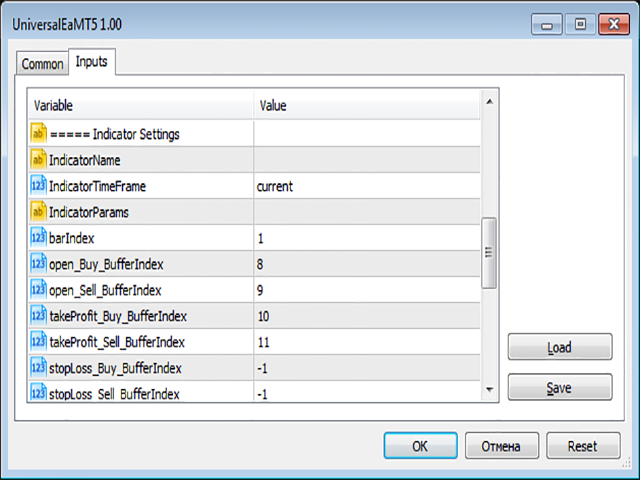 The Expert Advisor polls the values ​​of the specified indicator buffers, opens / closes and maintains transactions according to the specified parameters. The parameters of the adviser, having values ​​in points, are calculated for an account with 4-digit quotes. For an account with 5-digit quotes, the values ​​are automatically multiplied by 10. To connect to your own advisor indicator, you must enter its name and specify the used buffers. The indicator should be in the standard folder. The values ​​specified in the parameter string are converted by the program to int, double, bool, string values. Parameters must be separated by a comma. The value of int must contain only digits, double - digits with a period separator, bool - true or false, string - is limited to a single quote. For example, string 0,0.0, false, 'text' contains 4 parameters of type int, double, bool, string.